Fraud can come in many forms. 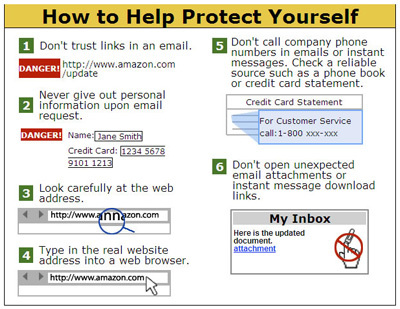 It is important as a consumer to protect yourself to avoid becoming a victim. One of the most common types of fraud attempts is to steal your identity. Identity theft starts with the misuse of your personally identifiable information such as your name and Social Security number, credit card numbers, or other financial account information. For identity thieves, this information is priceless. Dumpster Diving. Rummaging through trash looking for bills or other documents containing your personal information. Skimming. Stealing credit/debit card numbers by using a special information collection/storage device when processing your card information. Phishing. Acquiring information such as usernames, passwords and credit card details by masquerading as a trustworthy entity usually via email. The email often instructs users to enter details at a fake website that looks and feels like they are on the legitimate website. Communications purporting to be from popular social web sites, auction sites, online payment processors or IT administrators are commonly used to lure the unsuspecting public. Mail Theft. Stealing your mail from your mailbox hoping to find bank statements or payroll/social security checks mailed to your home. Credit: APWG, Carnegie Mellon Universtiy, and Wombat Security Technologies, Inc.
Be careful of how you disclose private information, such as displaying your Social Security Number on checks. Shred documents such as credit cards, insurance & other financial statements before discarding. Review transactions (online is best). Be alert for statements that don't arrive as expected. Ask for your free credit report every 12 months. Visit www.AnnualCreditReport.com or call 1-800-322-8228. Follow reporting procedures shown below to speed your recovery. File a police report. The best way for the authorities to bring criminals to justice and prevent future fraud is through sharing information. Your police report helps authorities gain insight on how the crime was committed. You can also share a copy of the police report with banks and credit card companies as evidence of the crime. Call the Federal Trade Commission Identity Theft Hotline at 1-877-IDTHEFT (1-877-438-4338) or visit the FTC web site at http://www.ftc.gov/idtheft for victim support and assistance. Take advantage of identity theft protection benefits you may subscribe to or which may come with your bank account. If you suspect your identity or financial information is being used fraudulently, call your bank and credit card companies immediately. The sooner you act, the better the chances of catching the culprit and of limiting the damage. File a police report. The best way for the authorities to bring criminals to justice and prevent future fraud is through sharing information. Your police report helps authorities gain insight on how the crime was committed. To report a phising and/or fraud attempt, contact us at 808-544-0500 or toll-free 1-800-342-8422. © Copyright 1999-2019, Island Pacific HomeLoans, LLC. All Rights Reserved.